January Labs was a brand that originally sent me products in the latter half of last year. I had not heard of them before, but finding new brands is genuinely one of the best parts of what I do. This brand are so off the radar that they are unavailable in the UK (don’t worry, I’ve had words, that’s a temporary situation) and only in select spas/specialist retailers in the USA. They do ship, however, from their online store. Details to follow below. After playing with the products, this was easily the one I used the most and those of you on Instagram will have seen this repeatedly. It doesn’t specifically say, so I would say at the very least, natural and vegan. Tested on animals/sold in territories that require testing? Spritz after acid toning or throughout the day. If you’re particularly dehydrated like me, spritz and reapply a little moisturiser on top. Lovely. I just really like this. Spritzs/facial mists are not something you want to spend a lot of money on if you’re on a budget, most of them essentially acting as fancy water. For that reason, I do like ones that throw in ingredients that either soften, soothe, are antibacterial (like Serozinc) or help the hydration stick around a little longer etc. This does all of the above and more. Spritz as and when needed. It’s almost a moisturiser on its own. I have used this successfully at the same time as retin-a creams with no bad side effects. 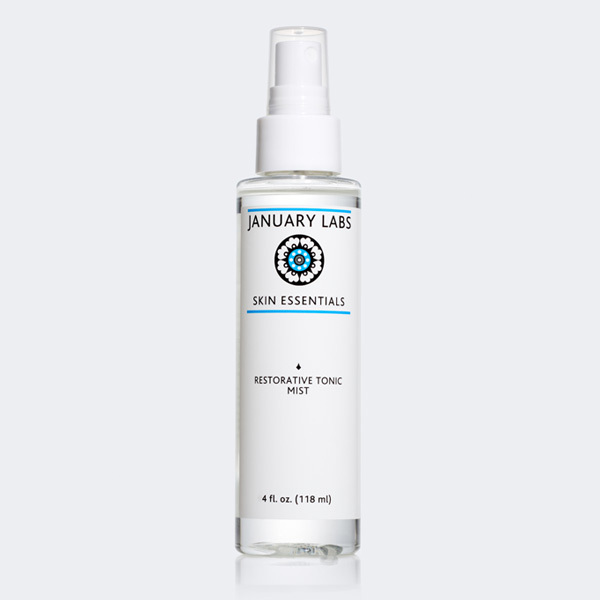 January Labs Restorative Skin Mist is $24.00 for 118ml and available here: www.januarylabs.com/skin-essentials/restorative-tonic-mist – they’re a small business so if you contact them, do give them time to get back to you.